This article is about the GameCube game. For the Game Boy Advance game known as "Mario Power Tennis" in Europe, see Mario Tennis: Power Tour. Mario Power Tennis, known in Japan as Mario Tennis GC (マリオテニスGC Mario Tenisu Jī Shī), is a sports game for the Nintendo GameCube and a re-release for the Wii (via the New Play Control! series). It is the third direct installment in the Mario Tennis series, and the follow-up to Mario Tennis for the Nintendo 64. This game features other four European announcer voices. 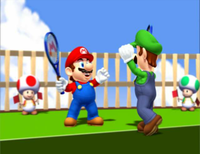 In this game, Mario and his various friends and enemies meet up to play tennis. Like previous Mario sports titles, all the playable characters have incredibly powerful Power Shots. Additionally, there are courts in the game that have special effects and events during the game. For each court, there are also special games to play. Mario and Luigi celebrating their win against Wario and Waluigi. 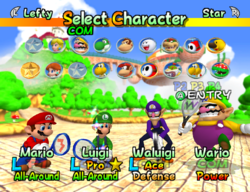 The game's opening begins with Mario and Luigi playing a match against Wario and Waluigi. The Mario Bros. win the match and celebrate as Wario and Waluigi complain about their loss. Bowser is seen surveying the match through hidden cameras. The next day, Wario and Waluigi see a picture of Mario and Luigi on the "Peach Dome Tournament" board and are furious to see that their opponents have knocked them out of the running. Wario and Waluigi vandalize the picture of Mario and Luigi, but the police pursue to arrest them. Wario and Waluigi escape into a janitor's closet, but they fall into what appears to be a training room. Bowser approaches them and offers an alliance to get revenge against the Mario Bros.. After hours of training and seeing others playing their tennis matches, they carry out a plan to attack the final tournament later that evening at the Peach Dome. As Mario and Luigi are about to play the final match of the tournament against Yoshi and Donkey Kong, Bowser shows up on an airship-shaped blimp and rigs the tournament so that Wario and Waluigi can have their rematch with the Mario Bros., shocking the tournament hosts, Princess Peach and Toadsworth. The audience gets furious at Wario, Waluigi, and Bowser wanting them to leave, but Wario and Waluigi silence them by setting up a machine that fires Bob-ombs at the Mario Bros. Bowser in the meantime, throws Bob-ombs at them. However, Mario and Luigi deflect the incoming Bob-ombs back at them with their tennis rackets. Other characters, such as Diddy Kong and Koopa Troopa, are briefly seen helping the Mario Bros. fend off the Bob-ombs as the spectators evacuate from the stadium. As a last resort, Bowser launches a Bullet Bill from his blimp at them, and Mario knocks it back with his racket, which fires back and hits Wario's Bob-omb launcher. Waluigi is about to retrieve the launcher, but Wario falls and crushes him. The launcher, flipped from the explosion, accidentally fires a Bob-omb at Bowser's blimp, destroying it and revealing Bowser's stock of Bob-ombs below his blimp, shocking Peach, Mario, and Luigi. Bowser's blimp starts to descend out of control and falls toward Wario and Waluigi. Wario and Waluigi attempt to escape, but Bowser crashes to them with the Bob-ombs onboard, causing them to blow up on impact creating a large explosion. Afterwards, the trio falls unconscious after the blast, and their plan to attack Mario and his friends has completely failed, despite the damage they have done to the stadium. Mario and Luigi are relieved and unharmed, and Mario breaks the fourth wall by saying "Mama mia" at the camera before the scene ends. Bowser watches Wario's and Waluigi's defeat. Wario and Waluigi walk in the Peach Dome to check out the tournament board. Wario and Waluigi check out the tournament board. Wario and Waluigi are eliminated. Wario and Waluigi evade the police. Wario and Waluigi enter a room, just to realize that there's no floor. Wario and Waluigi encounter Bowser. Wario and Waluigi think about Bowser's proposal. Wario and Waluigi run on a treadmill, while avoiding a Chain Chomp. Toadsworth and Peach presiding over the "finals tournament" at the Peach Dome. Wario and Waluigi interrupt the tournament finals. Peach is shocked about the unusual event. Wario and Waluigi prepare their attack. Diddy Kong and Koopa Troopa assist with stopping the Bob-omb onslaught. Desperate, Bowser joins in with the attack on the Mario Bros.
A Bob-omb is fired at Bowser's airship. Peach in shock after seeing that Bowser's downed airship contains a massive amount of Bob-ombs. Wario and Waluigi attempt to get away from Bowser's falling airship loaded with a massive amount of Bob-ombs. Wario, Bowser, and Waluigi collapse. Players participate in a tennis game, just as its precedents in the Mario Tennis series. To win, the player must score points by hitting the ball into the other side of the court and not making the opponent rebound the ball, just as the traditional way of playing tennis. Players earn 15 points for every shot that is successful and can win the game by earning set, game, and match points by earning 60 points on each game. The amount of set and game points can be set by the player in exhibition mode, but not in tournament mode. : The players can use the Analog Stick to scroll through menu items. : Pressing the button once makes a selected character left-handed. Pressing it again makes the character right-handed. : Pressing the button once makes a star for the character. Pressing it again removes the star. Stars are only obtained by beating the Star Cup. The controls here are assumed the normal control style. The control options are changed in the options menu and before the start of a match. : The players can move around and also aim direction of ball they just hit. : The players execute a topspin shot (if the players hit the button twice, they will execute a strong shot). Topspin shots are faster with a higher trajectory than slice shots and the ball's trail is colored red when a topspin shot has been taken. when ball is on the other side of the court: The player will taunt at the opponent. If the animation finishes, the glow around the opponent's racket grows smaller. : The players execute a slice shot (if the players hit the button twice, they will execute a strong shot). Slices are slower with a lower trajectory than topspin shots and the ball's trail is colored blue when a slice shot has been taken. then : The player can lob, which can send the ball flying up in the air. It can fly over the opponents' heads. then : The player can perform a drop shot which is a very weak shot that goes barely past the net. It is performed to deter players who like to go far away from the net. and : The player can perform a flat shot. When the ball is lobbed, a smash point appears and the player can perform a smash shot instead of a flat shot. Flat shots' trails are colored green while smash shots' trails are colored purple. and either or : The player performs a powerful Offensive Power Shot if power shots are turned on and if the player's racket glows to a certain amount of intensity. The power shot depends on the character. The players also must be in a certain distance or they will perform a defensive power shot instead. Note that any offensive power shots that occur before this still has an effect on the player who will use the power shot. and either or : The player performs a Defensive Power Shot, which can cover the ball to great distances if power shots are turned on and if the players' racket glows to a certain intensity. This power shot also depends on the characters, but not as much as offensive power shots. Any offensive power shot that has been execute before this will not have any effect on the players if they use the defensive power shot. : The players can cancel charge shots. and either or : The players can jump towards the ball. : The players can change the camera view. The options are stationary, player, and dynamic. Players participating in Item Battle Mode. Up to four players can participate in this versus mode. The players can choose their characters, a court, and what type of game that they can play. The player can also adjust rules in versus match, such as turning power shots on and off, setting the numbers of games and sets, and choose which character to pair with when playing in doubles. Computer levels can also be set by the player, and they range from easiest to hardest: novice, intermediate, expert, pro, and the unlockable ace difficulty. There are three types of games that the player can play. Standard Court: The player and the opponent participates in a chosen course with no gimmicks of any kind. The only gimmicks present are the bounce intensity, speed of the ball, and the power shots, if turned on. Standard Courts for any court that is not Peach Dome must be unlocked first by completing the Gimmick Masters tournaments. Gimmick Court: The player participates in the same game as in the court, but with gimmicks that can help or hinder the player, unique to each court. The Peach Dome is the only court that cannot have gimmicks of any sort whatsoever. Item Battle: The player can use special items to help them win against the opponent. To do so, the player must hit an Item Box with the ball and receive a random item, very much like in the Mario Kart series, except that the item received isn't dependent if the player is losing or not. Green Koopa Shell: 3 shells zoom out in straight lines. If the player gets hit by one, they will stumble and lose time, possibly going as far as help the opponent gain a point. Red Koopa Shell: One Red Shell comes out and chases after the opponent. The effect is similar to that of a green shell if contact has been initiated. Mushroom: The Mushroom increases the player's movements for a brief moment of time. It also grows the player back into normal size quicker if they had been shrunk by Lightning. Banana: A stationary banana gets shot out. If it hits the ground, the banana remains there. Slipping on a banana peel also has the same effect as shells. Star: The Star increases the player's abilities and it makes the player invulnerable for a short period of time. It also grows the player back to normal size quicker, if the player was shrunk by Lightning. Lightning: The Lightning strikes the opponents of the court and shrinks them to a tiny size. The opponent's speed, stature, and power will also decrease. The content and number of the item boxes depends on the court being played on. Luigi's Mansion: 10% higher chance of lightning bolts. Delfino Plaza Court: 10% higher chance of mushrooms. Wario Factory: Twice as many item boxes. Gooper Blooper Court: 10% higher chance of red and green shells. Donkey Kong Jungle Court: 10% higher chance of bananas. Bowser Castle Court: Same as Bowser Castle Gimmick Court. Mario Classic Court: 10% higher chance of stars. Ring Shot: The player scores points by hitting rings to win the game. The player earns the points in the rings by winning the point in the game, which depends on how many rings the player has shot. The losing player will give half of their points to the winning player in charge amount. The amount of ring points needed to win the game ranges from 100, 200, and 500. Mario pits against opponents in the Planet Cup. The player pits against simultaneous matches against computer opponents to win the trophy in a cup. The higher the cup level, the harder the computers will get. Once a character has completed Star Cup, the character receives a star ranking, strengthening hitting the ball. This rank also allows the character to participate in the Star Tournament, where the opponents also have the star ranking and are generally more difficult. The player can also participate in a Gimmick Tournament, which, as the name implies, enables the player to participate in Gimmick matches in courts against the computer. Although a Doubles Tournament is available, only one player can participate, forcing the player to be paired with an AI-controlled partner of their choice. Additionally, completing the World Open in Doubles does not grant the character a star ranking, so players must complete the Singles tournaments first to participate in Doubles Star Tournament. These tournaments are held in the Peach Dome court. Just like the World Open, these tournaments are held in the Peach Dome as well. However, as the tournament suggests, CPU opponents are all star characters. Players participating in "Artist on the Court". Players have the option to play special games as an alternative to going in tournament or exhibition mode. Up to four players can participate in the special games except for Gooper Blooper Volley and Mecha-Bowser Mayhem, which are only for one player. All courts have specific special games that are unique from one another. 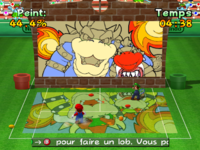 Artist On the Court: Players must color a design on a wall using paint balls to complete the minigame. In order to progress and achieve harder levels, the player must complete the designs within the time limit. Designs include Mario, Luigi, Diddy Kong, Bowser and Bowser Jr., and a rainbow of Yoshis, in increasing order of difficulty. Balloon Panic: Players must prevent Klaptraps from bursting their balloons by hitting balls at panels to make them change direction. The game ends when a Klaptrap pops a balloon. Chain-Chomp Challenge: Players must feed a hungry Chain Chomp with balls. Bob-ombs make the Chain Chomp turn red and earn the player two points for every ball, but hitting the Chain Chomp with another Bob-omb will let the Chain Chomp out and waste the player's time with the need to activate a switch. Water balls place angry Chain Chomps back into their normal positions, and put normal Chain Chomps to sleep. The player can wake the Chain Chomp up by smacking a Bob-omb into it. Players can also tamper with other players' progress. Gooper Blooper Volley: Players must rebound hits from a Gooper Blooper in a regular tennis game. However, the player also must avoid rebounding their ball into the gray zone that changes constantly throughout the game. Messing up ends the game. Mecha-Bowser Mayhem: Players must defeat a Mecha Bowser that produces beams of light by swinging its tennis racket. Mecha Bowser can attack the player by breathing fire and shooting Bullet Bills. The game ends when either the player or Mecha Bowser is defeated. Terror Tennis: The players must prevent ghosts from coming out of the paintings and attacking them. They have to earn a certain amount of points before the time runs out in order to proceed to more difficult levels. The player gets more points if they hit the ghost that is just about to come out of the painting. Tic-Tac-Glow: The player must get three Shine Sprites in a row in order to earn points. They can do this by hitting balls to the other side of the court, while hitting the FLUDD icons, in order to spray goop away from the site. Coin Collectors: The player must earn coins that enter the court while avoiding fireballs. They can only move left and right, but they can hit tennis balls to hit the POW block for more coins or the destruction of the fireballs. The player with the most coins wins the game. Continue: When the players select this option, they can resume a previously saved game. Players can save a game during the middle of a match or before a tournament is started. However, any midgame points gained will reset to 0-0. The game can hold up to three continue files. Records: Players can view records on all types of game modes played. If the records are on Exhibition, they can view what character they played and won against. Note that this only applies to beaten computer players by the player shown in a table. The shape of the win depends on the difficulty of the computer (a triangle means novice, a circle means intermediate, a circle with a dot in the middle means expert, a moon means pro, and a star means ace. Plus, a small star icon on the top right corner indicates that the computer was beaten when starred). If the records are on Tournament, the players can view the trophies won in a singles or doubles match with the character the player chosen. In Special Games, the players can view how long and/or how many points they achieved and the difficulty played on. Options: The players can adjust in game settings, such as setting the sound system to mono, stereo, or surround, turning music on and off, turning rumble on and off, and setting control options. Control options can be set to easy, normal, and technical, which differs the controls the players must use. The players can also choose to delete save data, but once it is deleted, it cannot be restored. A total of 18 characters are playable in Mario Power Tennis, of which 14 are default and the other 4 need to be unlocked before they can be played as. Characters are divided into 6 different play styles, listed below. All Around: A character that is above average in all categories. Speedy: A character that can get to the ball in time, but lacks raw strength and often reach. Power: A character that can hit the ball with great force, but lacks speed and ball control. Technique: A character that can place the ball on the corners of the net, but can lack speed and power. Tricky: A character that can curve the ball, but often lacks reach. Defense: A character that can easily hit the ball from any position, but lacks power and speed. Although their stats are not visible, each character has slightly different attributes from each other. For instance, Bowser has more power and reach compared to Wario, but Wario has better control, movement, and volleying. Win all World Open cups (Mushroom, Flower, and Star) in Singles. Win all World Open cups (Mushroom, Flower, and Star) in Doubles. Win all Gimmick Masters cups (Fire and Thunder) in Singles. Win all Gimmick Masters cups (Fire and Thunder) in Doubles. Box art of the Wii "New Play Control!" version for Mario Power Tennis. 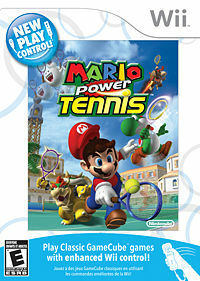 For the Wii version of Mario Power Tennis (via the New Play Control! 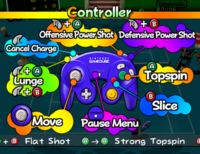 lineup), the game makes use of the Wii's motion controls instead of the Nintendo GameCube controller (which this specified version cannot be played using the latter). This version includes a tutorial movie to demonstrate how to use the Wii Remote in this game. It is also possible to play this game in 16:9 widescreen mode. Players can choose to play with the Wii Remote only, or with the Wii Remote/Nunchuk combination for advanced control of playable character participants. 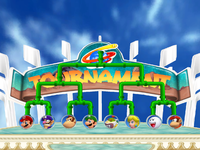 In the intro of the game where Wario and Waluigi are checking out the tournament board, the player can see Toad and Toadette on the left. It is unknown if they were intended to be playable or if it is a simple cameo. Unused models found within the game's files include a Hammer Bro (with its filename implying that it was meant to be the linesman) and 3D sprites for a Spiny, a Shellcreeper, and a Fighter Fly. Presumably, the latter two models were to be used for the Mario Classic Court as either spectators or obstacles. In the final game, they use their sprites from the NES version of Mario Bros. During production, the game was called Mario Tennis. Donkey Kong: The title screen music is played during the clip when Donkey Kong receives his trophy. Mario Bros.: The Mario Classic Court stage is unlockable. It features Shellcreepers and Sidesteppers on the sidelines and the gimmick court feaures a POW Block and a Freezie. The Game Over theme can be heard in Coin Collectors. Super Mario Bros.: The overworld theme is heard during part of the credits. Donkey Kong Country: In DK Jungle Court, the music for this game is played. Also, Klaptraps serve as hazards and Kritters stand along the outer edge of the field. Super Mario RPG: Legend of the Seven Stars: Bowser's Castle from this game can be seen during the opening cutscene of the Bowser's Castle Court. Yoshi's Story: The music from the first level of this game is played during the clip when Yoshi wins his trophy. Wario Land 3: The overworld theme from this game, particularly from the level Out of the Woods, is played during the clip when Wario wins his trophy. Mario Tennis: Bowser owns another court, and aspects, such as items, and the stage tilting from the characters' weights, return in the court. Also, some of Mario and Luigi's voice samples, most notably their serves, are reused. Mario Kart: Super Circuit: The Lightning Cup is originated from this game. However, it goes by its Japanese version name, Thunder Cup, as part of the Gimmick Masters tournament. Luigi's Mansion: The stage Luigi's Mansion Court is from this game. It features ghosts who slow players down in the Gimmick Court. Luigi's Defensive Power Shot makes him use his Poltergust 3000, which originated from this game. Super Mario Sunshine: Two stages, the Delfino Plaza Court and the Gooper Blooper Court, are taken from levels in this game. Also, the icons from the Main Menu are Shine Sprites. Gooper Blooper also appears in one of the Special Games. Petey Piranha is an unlockable character. Mario Golf: Toadstool Tour: The opening logos are reused. Several voice clips are reused as well. Mario Kart: Double Dash!! : The item boxes are identical to the ones in this game, and so are the items themselves and the item boxes' sound effects. Toadette makes a cameo appearance during the game's opening cutscene. The 3-second countdown sound effect is used when a round of Artist On the Court is about to begin. WarioWare, Inc.: Mega Microgame$! : The Wario Factory Court and the visuals therein are based entirely on this game. Mario Super Sluggers: Several voice clips are reused in the game. Mario Tennis Open: Aside from being the game's follow-up, several voice clips and sound effects are reused, including the announcers in multiple languages. Mario Golf: World Tour: Several voice clips are reused in this game. Mario Tennis: Ultra Smash: The announcer's voice clips are reused. Mario Sports Superstars: Several voice clips are reused in this game. Various character artwork is reused for tennis amiibo cards. When returning the ball, Mario accidentally hits it against Luigi's face, to which Mario apologizes. Although Luigi complains about the injury on his nose, he is shown with a black eye. Wario and Waluigi trip and fall when entering the outer skirts of Peach Dome. While vandalizing the Mario Bros. poster, Waluigi hits the camera with his marker, taking it down. He then apologizes to the cameraman. One of the police officers falls while giving chase to Wario and Waluigi. Wario and Waluigi find the door in which they will hide from the police, but it slams shut before they can enter, making them smash face-first against it. In the same scene, they manage to enter through the door; however, Waluigi's leg gets stuck as the door closes. One of the police points at it and Wario is heard muttering, "Stupid...". When Bowser activates his ball-serving machine, a malfunction sends the balls hurtling against him from somewhere else off-camera. He runs off, frightened, slamming against the cameraman, as Wario and Waluigi, offscreen, laugh. When Bowser turns on a switch, it breaks off in his hand. He laughs. In the same scene, the switch electrocutes Bowser, and he faints. Waluigi rushes to aid him, but not before warning Bowser, "Don't expect mouth-to-mouth!" Wario is weightlifting, and seems to make a huge effort with the massive weights. Suddenly, his cell phone rings and he picks it up with his left hand, without dropping the barbell in his right hand. It is seen that he was just pretending his effort, as he talks nonchalantly at the phone. Waluigi, displeased, calls the cut by placing his hand on the camera lens. Wario seems to be talking to his mother in this segment, for he says "Hello? Ma! I told you not to call me! I'm making a movie..."
Wario's and Waluigi's Bob-omb launcher device gets jammed by a stuck Bob-omb. Waluigi then calls for the Prop Guy. Bowser's Bullet Bill Cannon explodes in his face when he fires, causing him to hold his jaws open in shock. The Bullet Bill falls just ahead of Mario before he can return it at Bowser's Airship. Mario shrugs at the camera, laughing. When Wario and Waluigi jump down to the court to escape the damaged launcher device, Wario falls head-first into the ground, getting stuck in a hole, prompting Waluigi to laugh (even though Wario's falling body nearly hit him). When Bowser, Wario, and Waluigi appear on the big screen behind Mario and Luigi after the three's defeat, a Paratroopa goes across the screen and they all start laughing. Waluigi accidentally hits the camera with his marker. Wario and Waluigi slam into the door they were going to enter. Waluigi gets his leg stuck in the door. Bowser gets electrocuted after activating the switch. Wario grabs his cell phone while weightlifting. The Bob-omb launching device malfunctions. Bowser's Bill Blaster explodes on his face. The Bullet Bill fails to reach Mario's range. Waluigi avoids getting hit by Wario. A Koopa Paratroopa pops up behind Wario, Bowser, and Waluigi. It has been requested that additional images be uploaded for this section. Remove this only when the image(s) have been uploaded for this section. Specifics: Upload images related to each animation described below. When a character wins a tournament, his or her celebration will be shown. In each one, an event occurs. Mario: Mario holds his trophy, celebrating his victory. Peach, also pleased, holds Mario in place and crouches to kiss Mario's cheek. Mario, in love, puts down the trophy and then jumps to do a cheer. Luigi: Luigi is doing a victory dance when Mario arrives on stage applauding. He pats him on the back but appears to intentionally step on Luigi's foot out of jealousy. Peach: Peach celebrates with Mario and Luigi while Wario and Waluigi look on. She blows a kiss to the Mario brothers, making them float. Then, Wario and Waluigi try to steal the trophy, but Wario slips on a tennis ball, knocking over the rack the trophy sat on and flinging the trophy into the air. Peach catches the trophy. Yoshi: Yoshi is waiting for his prize when his stomach grumbles. He is saddened by having nothing to eat at the moment, until Luigi arrives on stage with the trophy. He sees the object as a big and juicy pineapple. Yoshi tries to eat, but ends up swallowing Luigi. He is surprised by his disappearance. Bowser: Bowser is cheering and laughing, with Peach at his side. He asks for a kiss on the cheek and closes his eyes. Peach then gets a red Birdo to kiss him. When Bowser sees it, he runs away. Bowser Jr.: Mario, Luigi, Yoshi and Yellow Toad are waiting to reward Bowser Jr. Suddenly they hear a chuckle, which happens to be him snatching the trophy and making poses afterward. Daisy: Luigi is about to give Daisy her prize. She comes in, skating at high speed, making Luigi spin. She skates into him, making him throw the trophy up. In slow motion, Daisy catches the trophy. Donkey Kong: DK is on stage. Toad arrives with the trophy and DK grabs it, unaware that Toad is still hanging on to it. DK shakes the object several times until Toad falls off. Diddy: Luigi and Peach are in the area with Donkey Kong, who is playing a bongo. Diddy arrives, jumping and running around Luigi, and then picks up the trophy with his tail. Diddy throws his prize up, jumps on the bongos, and catches the trophy. Diddy then jumps on DK's shoulder and they both strike a pose. Wario: Wario walks and jumps around until he falls off the stage while still holding the trophy. He lands on it, and when he gets up, he is shocked to see it flattened, so he picks it up and sadly shows it off. Waluigi: Waluigi holds the trophy and does a dance with Wario. Wario pushes Waluigi, making him fall, losing his grip on the trophy. As he tries to get up, the trophy hits him on the head. Boo: The Mario Brothers wait for Boo when the trophy begins to levitate. Mario and Luigi are frightened, until they saw that Boo was invisible when he got it. Several other Boos appear, two of which carry Mario and Luigi. Koopa Troopa: Diddy is eating bananas and throws a banana peel near Mario, Luigi and Peach. Koopa Troopa comes in and slips on the peel. Mario and Luigi try to dodge, but Koopa Troopa hits the face of Luigi, who throws the trophy. Koopa Troopa catches it. Paratroopa: Wario ties Paratroopa to the string of a fishing pole while Waluigi holds back the trophy, to prevent Paratroopa from getting it. Wario pulls back the rod, but Toad cuts the string with a large pair of scissors. That causes Wario and Waluigi to fall, making Paratroopa get the prize. Shy Guy: Luigi waits in place. Shy Guy arrives, walking happily. After climbing the steps, he falls and drops his mask. Luigi gets very scared seeing his true face, but Shy Guy quickly puts his mask back and takes the trophy. Fly Guy: Wario and Waluigi pretend to offer Fly Guy the trophy, but Waluigi grabs Fly Guy with a giant pair of pliers. This causes Fly Guy to spin wildly out of control, knocking down Wario and Waluigi, and launching the trophy into the air. Fly Guy catches the trophy and celebrates with Peach. Wiggler: Luigi and Diddy Kong give Wiggler the trophy, but Diddy Kong accidentally rolls the tennis ball, causing Wiggler to slip on it and drop the trophy. Luigi and Diddy Kong, nervous, watch Wiggler get angry, but it calms when it sees its trophy. Diddy Kong, however, loses his footing, bumps into Luigi, and they both land on Wiggler and knock the trophy away. The Wiggler gets angry and then chases Diddy Kong and Luigi. Petey Piranha: Mario presents the trophy to Petey Piranha while Peach, Koopa Troopa, Shy Guy and a pink Toad look on. Petey then begins to jump in place excitedly, shaking the platform. After he takes the trophy, Petey jumps into the air. Mario, Peach, Koopa Troopa, Shy Guy and the Toad brace for impact, but when nothing happens, they look up and see Petey flying, whilst clutching the trophy in his mouth. Notice how Mario is not getting pushed back, as seen in the Offensive Power Shot Immunity glitch. Mario or Luigi rebounding an Offensive Power Shot with their Offensive Power Shot may not push them back or reverse their controls. However, Mario or Luigi still slow down from Offensive Power Shots such as Petey Piranha's Sludge Racket. Occasionally, when a player-controlled Wario uses his Offensive Power Shot, Wario will begin saying his Defensive Power Shot Audio instead of his Offensive Power Shot Audio. The Incorrect Wario Audio glitch has only been found on the Wii Version. If a player or team earns the required amount of rings during a ring match before the opponent or the opponent's team does, but misses the ball or hits it out, it triggers their losing animation as though the player or team lost the match, while the opponent player acts as if the match is won. In the results screen, however, the animation and results are correct, meaning the Inappropriate Match Animations glitch does not prevent a recorded win. This glitch requires good timing. In item battle mode, the server must hit the ball and activate the "fault" message. The opponent must have a banana item and after the "fault" message is activated, they must hit the ball while making sure it doesn't touch the ground before the ball is back to the server. If done correctly, the banana will still be seen on the ball with the server. However, it behaves normally. Nintendo Gamecube Raymond Padilla, Gamespy 4/5 Though Mario Power Tennis is quite different from the previous version, it's a superior product in almost every way. It's based on excellent gameplay mechanics that are taken in really interesting directions through gimmick courts. Mastering each player will take dozens and dozens of hours. Multiplayer games are a total riot. Though it doesn't look or sound as good as other games on the market, there's no denying the sheer amount of fun this game offers … even if Camelot ruined Shy Guy for me. Nintendo Gamecube Chris Kohler, 1UP 8.5/10 So in a way, it's much like the game of tennis itself. There's no reason why hitting a ball back and forth until somebody drops it should be much fun, but it sure is. 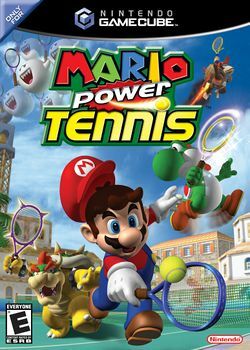 And Camelot's finessed, perfected tennis engine means that Mario Power Tennis -- for all its bizarre features and explosive moves -- is one of the best choices for tennis buffs on the market today. Nintendo Gamecube Matt Casamassina, IGN 8.5/10 Mario Power Tennis is a solid update to a great Nintendo 64 game. The fundamental play mechanics are more or less the same, which is in my book just fine given that I liked them to begin with...That said, some of the additions are a mixed bag. The new power moves, while cinematic and certainly pretty, can jar the flow of matches and make it difficult to continually follow the ball. And the new Gimmick Courts, sometimes filled with flashing lights and other obstructing obstacles, share exactly the same problem. Nintendo Gamecube Tom Bramwell, Eurogamer 8/10 We could take this opportunity to strut up and down ranting with self-righteous indignation about the stagnation of Nintendo's first-party line-up and the amount of repackaging and sideways steps that seem to belie its newfound "Revolutionary" principles. But as long as the games are still this entertaining, and do enough to keep us satisfied, we'll be happy to play them. So we're not going to. Besides, that'd be a bit too grown-up. 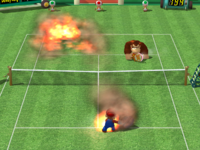 For this subject's image gallery, see Gallery:Mario Power Tennis. This is the last video game where Wario wears his original long sleeved shirt which was used in his early appearances. In all appearances after this game, he is seen wearing his current short sleeved shirt. This is the first game where Shy Guy receives a voice by Nate Bihldorff, who regularly voices Shy Guy in later Mario installments. This is also the first game where Takashi Nagasako provides his voice for Donkey Kong and later regularly reprises this role in later installments. Katsumi Suzuki begins his career as Diddy Kong's voice actor here as well. This page was last edited on April 19, 2019, at 20:17.